At the heart of it the JetPrivilegefrequent flyer programme, works on a simple consumer value proposition of rewarding its members with JPMiles for their everyday spends as well as transactions carried out with their 150+ Programme Partners. The accumulated JPMiles then can be redeemed for Free Award Flights to over 1000 destinations across the globe. So how do you earn JPMiles? FLY & Earn JPMiles with our 25+ Airline Partners: Fly Jet Airways, Etihad Airways or any of our Partner Airlines to over 1,000 destinations across the world and earn JPMiles. In case you forget to quote your JetPrivilege Membership Number, you can always Claim JPMiles for your past travel done on Jet Airways or any of JetPrivilege’s partner airlines for up to 180 days from the current date and not preceding the JetPrivilege membership enrolment date. Earn more JPMiles even when you are not flying with our RETAIL partners: There are multiple ways to earn JPMiles other than flying. Earn them across 150+ Programme Partners every time you stay with our Hotel partners, Shop with our Retail partners, Dine at our Dining partners and many more avenues to earn JPMiles faster. SWIPE any of our Co-brand Cards &Accelerate your JPMiles’ earning: You can earn JPMilesyou’re your everyday spends by using any of our Co-brand Debit/Credit Cards for all your transactions, be it shopping, dining, online ticket booking and a lot more. Apart from earning JPMiles, you can also get many other benefits like extended validity of JPMiles from 3 to 5 years, 5% discount every time you book on jetairways.com, a complimentary Economy Jet Airways ticket and many more. CONVERT your other loyalty & reward points into JPMiles: Convert credit card, debit card, hotel or reward points from other loyalty reward into JPMiles.JetPrivilege has over 26 conversion partners that makes it easier for members to reward themselves with more JPMiles. STAY with our Hotel Partners or book your stay with hotels.jetprivilege.com: We have partnered with some of the finest hotel chains both in India and international destinations. 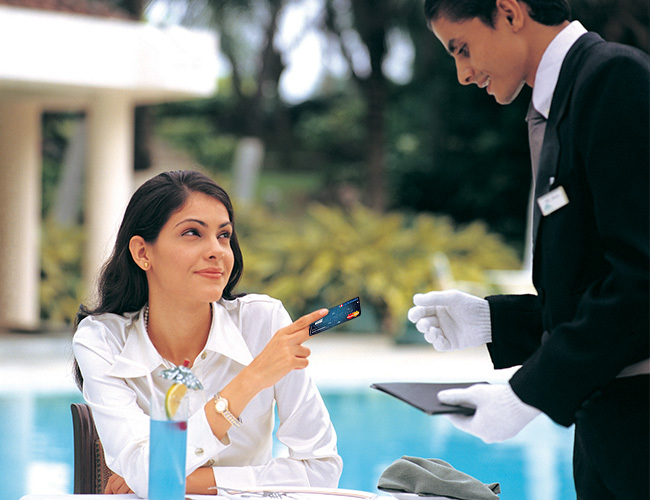 Anytime you stay with any of our hotel partners you earn JPMiles. You can also book your stay on hotels.jetprivilege.com (powered by Booking.com) – where you earn 4 JPMiles per Rs 100 spend, across 8, 00, 000+ hotels spread across 221+ countries. The best part is you pay when you stay. DINE with our Dining Partners or Book a curated dining experience with Delightful Detour:Our Dining Partners are spread out all across the country. You will always find a way to earn JPMiles when you dine. So whether you dine out with your family, friends, on business, leisure, or for any other reason you will be rewarded with JPMiles. Delightful Detour: Alternately, you can also book from our 100+ curated menus as well as uniqueexperiences. These are exclusively handpicked for JetPrivilege members at both 5-star & premium standalone restaurants. Write a REVIEW & earn JPMiles: Whether you stay with any hotel or dine, you can always write a review with our review partners like TripAdvisor where you can earn upto 1500 JPMiles each month. Apart from the above, you can also continue earning JPMiles by renting a car, subscribing to our magazine & publishing partners, or shopping across any of our retail & lifestyle partners. With the above multiple earning opportunities, you can accumulate a lot of JPMiles which can be redeemed for award flights across 1000+ destinations of your choice. If not a member yet, then Enrol now and start your rewarding journey today! Next article Kerala Backwater Tour Experience- Once In Your Lifetime, Always In Your Memory Lane!